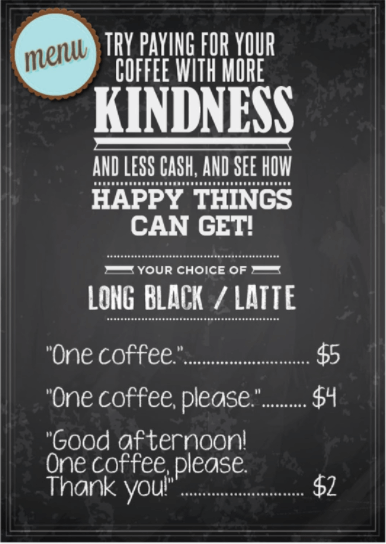 Isn’t it an awesome idea to charge people less money if they are polite? I am all for it. People often ask me about the difference between a Manager and a Leader. Leaders don’t need a title to influence people. They lead by example, they lead the way and they have basic life and social skills. Leadership = influence, character, growth mindset, controlled emotional response, mental strength and the ability to believe in yourself and others. You can demonstrate leadership in every aspect of your life. Do you put the shopping cart back where you got it from? Do you hold up the door for someone who enters the coffee shop behind you? Do you enter the plant/the office by consciously making an effort to say “Good morning”? Do you say “Thank you” on a regular basis for seemingly small and basic tasks (at home and at work)? Do you say “Please” if you want someone to do something (at home and at work)? Everything we teach our children often seems to be forgotten in the corporate world. This is an unfortunate result of pressure, stress, frustration and not knowing how to deal with all of that. Are we trying to save time by cutting out politeness? Word of caution: People follow what they see. The attitudes and the behaviours you expect from your team members have to be demonstrated by YOU first. Bummer! Please don’t expect more from others than you are prepared to deliver yourself. Everyone is supposed to play by the same rules. I am often amazed how much disrespectful behaviour is tolerated in manufacturing companies only because some people seem to think that people who have seniority and/or great “technical skills” (the skills to do a job) have earned the right to be rude. Nobody comes to work to be belittled or yelled at. Many times it’s not even what people say but HOW they say it (tone of voice, body language). Bullying and disrespectful behaviour in any kind of leadership position (CEO, President, VP, Manager, Supervisor, Area Leader, Team Leader) is something that cannot be tolerated if you would like to build a culture of innovation and excellence. Let’s make people aware about the importance of a simple “Hello”, “Please” and “Thank you”. This is such a great start. It’s the little things along the way that have the greatest impact. Let’s pull out all the stops on your road to excellence, shall we?